Aizawl, Aug 17 : Mizoram Chief Minister Lal Thanhawla assured the people of the state that the government would leave no stone unturned in maintaining peace and tranquility. 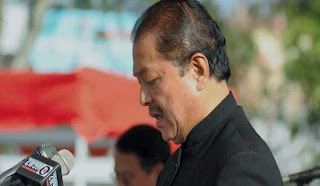 In his Independence Day speech after unfurling the national flag at the Assam Rifles ground in Aizawl, Chief Minister Lal Thanhawla said that flagship programme New Land Use Policy (NLUP) has made impressive progress and was well on the tract to realise the set goals of achieving development in the state. Lalthanhawla He said that 90,139 people have so far been benefitted under the NLUP and assistance for another 44,861 people would be started soon. The chief minister said that the atmosphere of peace in the state was disrupted on March 28 when the convoy of the Assembly Committee on Government Assurances members was ambushed by insurgents on the outskirts of Manipur border Zokhawthiang hamlet where three policemen were killed and five others injured. "Counter operation was launched by the Mizoram Police and in the ensuing operation self-styled Sergeant Malsawmkima of the HPC (D), a police deserted, was killed near theManipur border on May eight," he said.